According to michezoafrika.com, former Kogalo Chairman Fred Mwango has declared his candidacy for the position of Vice Chairman at the forthcoming club elections. Mwango who is a former DC and earned notoriety for ordering a teacher to shave his untidy beard, was Kogalo chairman around the turn of the millenium. His time in office was not notable for any achievements. Roselinder Achieng has declared her candidacy for the position of Deputy Secretary general where she will be pitted against the incumbent Ben Wamugo among others. In a story that appears on the michezoafrika website, she says: “If and when elected, Roselinder has promised to work hand in hand with other elected leaders to transform Gor Mahia into a regional outfit and also to win back the glory of the team. She says the club needs to lead the way in introducing professionalism in management and setting up reliable and trusted structures that will help in managing the club to greater heights. 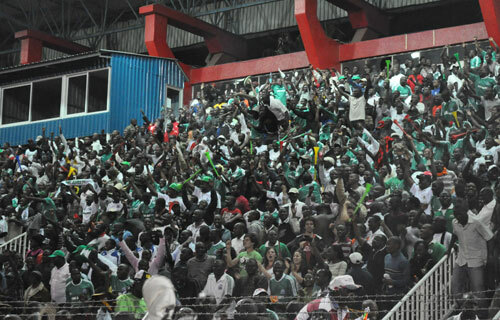 Top on Achieng’s agenda is to transform the club’s resource mobilization through creative merchandise promotions activities that will attract even the non Gor Mahia fans, introducing technology and adopting the e-ticketing approach in the sell and management of tickets, digitizing club information and accounts for transparency and accountability among others. “Gor Mahia is a big club and we now need to start marketing ourselves beyond our borders to tap into the wider African market by wooing international companies to come in and sponsor the team.” She said. “We also need to evolve with technology by gong digital, this is a new era and I will bring with me a lot of new ideas that will help the club brand itself as an admirable professional outfit. George Bwana who recently led Facebook branch members to donate airline tickets for the teams trip to Mombasa has declared his candidacy for the position of secretary general. One of the most vibrant Gor Mahia fans George Bwana has cast himself into the field to wrestle for the club’s Secretary General Position in upcoming elections set to be held on the 27th of this month at Nyayo National Stadium. Backed by his campaign team led by Bonny Gor and a host of young Gor Mahia fans who have vowed to ‘put things right’ during the forthcoming elections, Bwana expressed his desire to capture the seat on pure grounds of honesty and integrity during the launch of his campaign in Nairobi on Wednesday. Bwana becomes the second candidate to formally declare his candidature for the club’s spokesman position after Tom Ataro. Flanked by his supporters, he expressed confidence that he will win the seat to offer the change that the club has yearned for over the period. “My candidature is purely on grounds of honesty and integrity a test that most fans feel some current and former office holders have not met as per their expectations. When I get into office my first aim is to ensure that the secretariat is set up and fully furnished with the latest technological devices that will enable fans access the club’s accounts upon request,” said Bwana. The club goes to the polls on Sunday at the Nairobi City Stadium . For the Chairmanship, Ambrose Rachier will face stiff challenge from Businessman Collins Ajuok and Emmanuel Achayo. Tom Oriko has announced his candidature for the post of secretary General. The position is currently held by Mwalimu Nickanor Arum. Oriko has vowed to enhance players welfare and beef up club branches. He said he will bring more partners in the club and introduce good management systems that will pave way for steady revenue, digital marketing and a strong functional secretariat. I love this! Especially one of the kogallo divas in the name of roselinder! They have my full surpport! @ Dan post 2 you are spot on; i can not agree more. At long last the much awaited decision-making time has come and we all have the veto decide on which direction we are going to steward our delicate KO’GALO ship out the stormy waters. What matters is to vote wisely. I pray that we let reason prevail other than emotions and our stomachs. NB: In a nutshell i have declared to retain the Chair and the Senior vice chair Mr. Rachier and Captain Owino respectively;but for the rest” FAGILIA WAENDE NYUMBANI” for a fresh beginning. LET US PRAY FOR A PEACEFUL ELECTIONS AND MAY THE BEST WINNERS BE PROVIDED BY GENUINE KO’GALO FOLLOWERS. @Kesore our number one fan in the diaspora, I hope your monitoring the events remotely from Kampala. But as much as your not going to participate in voting on the material day we still require sense direct regarding the pattern of bloggers preference candidature. 1. Rachier is still the Chair. AND SO ON……………….and so forth………. @Kosero as an independent opinion voter please filter the voting pattern and provide the opinion polls. It’s action ttime and ask the bloggers to cast their votes on this blog so that you can provide an independent result prior to the D-DAY. Over to you at Kisero. . . .from 3 to 7, guys you are going nuts!Lol, everybody with his preferred leaders! . . . that is so funny! change to me is from top to bottom. unless that is done then the same GOR dainted with all this vices will remain. I only pray that those of you going to Vote will do so from passion and what they stand for the CLUB. dont sell your votes OOOOOH! I know that George Bwana has passion for the club!!!!!! !we need more than two ladies for this positions infact they should be automatically voted IN!!! !this for gender ballance. Its good we all have the liberty to vote and decide for ourselves for the sake of the club. Papamicky i happen to read from the same script as you..Change should be from top to bottom..i will not enumerate my preferred candidates but because Bro Ogango has mentioned about the opinion poll.I will definitely state that i will vote change, humility,accountability and progress. I believe that those eligible to vote will do so with their conscience mind and that they will vote for good governance and administration. Let us all vote with our conscience but not stomach.I know many people purporting to be fans are going to be ferried by people like Ataro to city stadium. This occassion should only be genuine fans but not for people for hire. @Agwa Kassam and Papamicky, am in total agreement with your views of the election. We need to be very careful with the people that will be elected. Jb, thats the disease..anyone is free to quote me for anything but i don’t believe only one person can finance GM. I’m a firm believer of ‘umoja ni nguvu’ and you can refer to my budget proposal a few weeks ago! Nöne of my ways and means for funding the budget talked about an individual funding GM. I wonder why we cannot borrow a leaf from european and south american clubs where membership contributions form a chunk of club income. I’ll remain firm and clear away from the past..GM is in need of a manager not a ‘purported financier’.. Jb u r right people are stuck with the past and are deciding in fear. I have not had an opportunity to interrogate the persons offering themselves for candidature during the forthcoming K’Ogalo AGM. This is where the finest brains in the country converge. They are the captains of industry, top lawyers in the city, doctors, engineers, pilots name it. Picking the best qualified candidate becomes our headache. To those of you who will have an opportunity to vote, please know that you carry our hopes and aspirations. Cast your vote wisely and independently. I feel sad that I will not attend our AGM. I have urgent personal matters to attend to at the village. The current rains pounding the country is making this trip a nightmare. It is my fervent believe that those who gonna be elected shall hit the ground running considering that we shall be participating in the confederation cup early next year. Finally I urge our supporters to give the new office unqualified support. Congratulations to AR on being re-elected GM chairman. We look forward to working with you as we strive to steer GM to greater heights of prosperity.